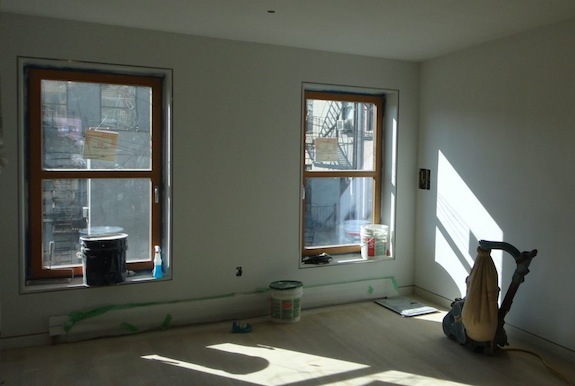 Going into the renovation process we had never chosen a heating and cooling system before. Our tilt-n-turn windows meant we couldn’t have window air conditioners. And when I initially thought through the HVAC choices I wasn’t really in favor of forced air since it tended to be expensive, dusty, and take up a lot of space. The exposed pipes will be painted white when it’s all done. Most of the radiators in the house are two units high – that one is in the rental bedroom wall and shorter than the rest – so to get the same BTUs we have everywhere else we had to go with the model that’s 3 units high. That’s inherently a pretty low-tech solution – a valve and a radiator. 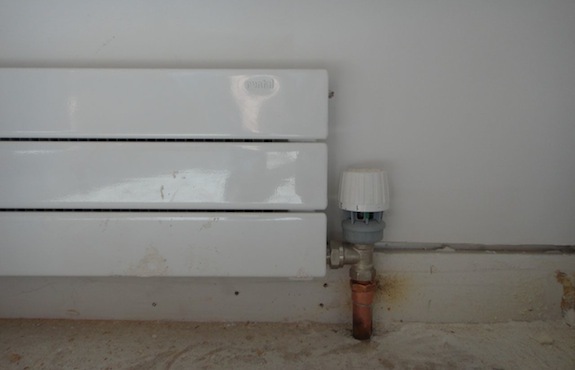 It’s just the radiator looks better than most and the valve is thermostatic – so it’s based on temperature works better than regular radiator valves. Because there’s a valve on every radiator we sorta get a zoned system where every room is a zone. It won’t work quite as well as a real zoned system with thermostats for every zone, but it also cost a lot less. And if we stay on top of it, it will probably perform about as well as a more sophisticated system. There will be one thermostat for the heating system. A friend’s post on Facebook turned me on to the Nest thermostat. If you haven’t checked it out, take some time and watch the promo videos on their site – it’s incredibly cool. I can’t wait to get one. That’s a bit of a problem because the tilt-n-turn windows limit our window covering choices. They swing inwards, so putting blinds at the top of the window framing is sorta impossible. We were thinking of doing a lot of curtains, but now worry the radiators won’t work very well when the curtains are pulled. One area where a forced air system might be better is air exchange. Since the house is well insulated, we may not have enough fresh air entering the house. That is easier to solve with a forced air system – you just incorporate a fresh air intake. But honestly I don’t think we’ll have much of a problem – 2 people in 3,000 sq. ft. shouldn’t be a problem. We are happy that we have mini-splits and that they’re both heating and cooling. The house is warm enough down to about freezing. It maintains 50+ degrees when it’s in the high 30s outside. That means we probably won’t turn on the boiler until it gets down around freezing. If we just need to take the chill out of the air in a single room (or if our tenant wants it to be warmer than we do) we can use the mini-split. The mini splits are a bit of an eyesore – we tried to hide them the best we could, but they’re still there hanging on the wall. I don’t think that will bother us too much. To us the visual noise of the mini split unit isn’t any worse than the soffits you often have with forced air systems. If you’re the type who doesn’t want to see a mini-split hanging on your wall there’s always the concealed models you can tuck inside a closet. Those have the advantage of being able to cool/heat two rooms (like a bedroom and an en-suite bathroom) – but the concealed models aren’t quite as efficient due to the ductwork. One other thing to mention is that we have radiators at each end of the house, and since the bathrooms are in the center of the house we were worried they could get a little cold. We were worried they could get a bit cold, so we put under floor heating pads in each bathroom with programmable thermostats. It’s not very efficient heat, but it won’t be used all that often – so it should be fine. The model numbers are Runtal unless except where they say Slant/Fin. Since we have exposed brick on one side, both pipes are actually on the same side of the building – right next to each other. 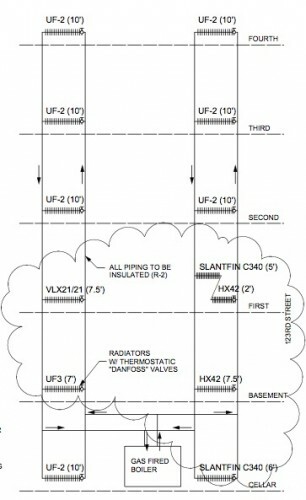 There are also valves to bleed air from the system in key locations (such as at the top of each riser). Notice that each radiator / loop has a Danfoss valve on it, so we can (nearly) turn off the radiator in rooms and the other radiators will get more flow.